If you’re looking to getting into smoking but don’t want the hassle of sitting around, tending a fire for hours then a gas/propane smoker is probably for you. But there are a lot of gas smokers on the market and choosing one can be difficult. We’ve done all the hard work for you and have found the best propane smokers on the market, written out a quick review for each and given you some extra information to help you decide which propane smoker is for you. 1.1 What is a gas smoker? 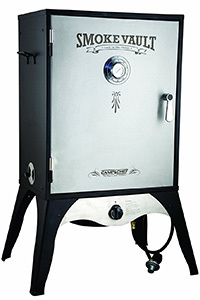 Gas smokers are convenient and simple to use smokers that offer great value for money. They’re a great choice for beginner smokers and are relatively pain free, offering a great “set it and forget it” option. They typically look like metal boxes on legs that can look like lockers or vaults. A lot of gas smokers use this simple design as it offers up so much potential cooking space and is very easy to use. There is usually a gas burner in the bottom of the box and a tray for wood chips above that. The smokers will connect to either a propane bottle or sometimes a natural gas line to fuel the flame. This will heat the box directly and also slowly burn the wood chips to create smoke. The heat and smoke are what cooks your meat placed above. There is usually a water pan placed above the wood chips to help regulate the temperature and to keep moisture in the inside atmosphere of the smoker. This helps to keep your food moist during long smokes. Above this is the main cooking chamber. The best propane smokers will have a separate door for this area. Having two doors on your smoker allows you to tend to the wood and water and check the flame without disturbing the temperature in the main cooking area. The cooking chamber will consist of several racks and shelves for the food. At the top, there is usually a vent or a chimney. This is generally matched by another one down the bottom. The amount these vents are opened will adjust the cooking temperature of your smoker. If you have any experience with smokers before you might realize that gas smokers are very similar to electric smokers. They are similarly designed, have the same general shape and have similar pros and cons. If you like the sound of a cheap but effective smoker but think that an electric smoker might suit you better, we’ve done a complete guide to buying the best electric smoker for the money which we’d recommend reading. Masterbuilt have a good range of lower budget smokers, including a good range of propane smokers. The Masterbuilt 20051311 GS30D 2-Door Propane Smoker is part of a range of smokers that share similar features but have different sizes. This range includes a 40 inch model, a 44 inch model and the 30 inch model that we’re going to review here. The Masterbuilt is a two door, steel smoker that’s ideal for beginners. It has a huge 717 square inches of cooking space which is more than enough for multiple chickens. The fact that is has two doors is incredibly useful and we find it to be almost a necessity with these types of smokers. It allows you to check the flame or add wood chips without disturbing the heat in the cooking chamber. The cooking chamber itself is fairly well built considering the price. It doesn’t quite have the quality or finish of some of the more expensive models but this will cost you under $200 so it’s to be expected. It holds its heat fairly well and there was very little smoke leakage. It also has a push button ignition which worked very well. No more slaving over coals to get a fire going. Stainless steel burner and type 1 regulator and hose. This means you’re getting a safe and efficient propane burning system. Good quality porcelain coated wood chip tray and water pan. Locking doors to ensure they don’t accidentally come open. The doors also have wire cool touch handles which are a nice feature. Overall, you’re not going to get much better for the money. It does an excellent job at smoking as the cooking chamber leaks so little heat. At this price range, you’re always going to be confronted with the problem of heat and smoke leakage but the Masterbuilt barely leaks a thing. The features are relative sparse as it’s a very simple smoker but that’s to be expected. The finish and built quality feel low-budget, but that’s what it is so we can’t complain. If you buy this you’ll also be getting the great Masterbuilt customer service that comes with it. So, we can’t really fault it too much considering the price. That makes it our choice for the best propane smoker under 200 dollars. Smoke Hollow have a good reputation for smokers and they excel at gas smokers. We have two on our list today. The 30164G is a 30 inch propane smoker that is very similar to the Masterbuilt that was discussed before. They share very similar designs and are in very similar price ranges. The Smoke Hollow tends to be a little cheaper but the prices vary all the time. 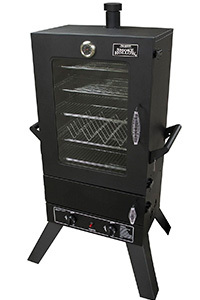 This Smoke Hollow propane smoker comes with three removable chrome plated cooking grids that are able to be placed on different levels to accommodate different types of meat. The Smoke Hollow has a very similar burner to the Masterbuilt and it manages to cook meat just as well. Both of them worked surprisingly well for such cheap smokers. Cool-touch spring door handle to be able to safely open the door. Door lock to be able to keep them closed when smoking. Push button ignition system which works very well. Built in thermometer for basic temp readings. Handles for easy movement and placement. The reason the Smoke Hollow is our second choice for the low-budget category is that it has a single door. We find that on longer smokes the fact that you have to open the cooking chamber door to get to the flame or water pan can potentially greatly affect the smoking time and effectiveness. It can still produce some very tasty food but there’s the potential inconsistency in the smoking. Talking about inconsistency, the in built thermometer isn’t very good at all. It was always within 10-15 degrees out from our digital thermometer. This just goes to show how important it is to use a quality digital smoker thermometer. Having said that, the Smoke Hollow is still a very good choice if you’re looking for a cheap propane smoker. It cooks food very well and for the price it is a brilliant choice for beginners looking to get their first smoker. Camp Chef have been around for many years and have a huge range of products, from smokers to pizza ovens. With the Smoke Vault they have truly created a uniquely designed product. It looks just like a classic western safe, having a beefy handle and a centered thermometer that mimics a classic dial combination lock. It really is a good looking smoker and we really appreciate that they tried something original rather than having the same old style as all the other brands out there. It comes in two sizes, an 18 inch and a 24 inch. The 24 inch is the one we’re focusing on today but the 18 inch is a good alternative if you’re looking for something a little smaller. The 24 inch model comes with two cooking racks that can be placed in four different positions. This means you can also buy extra racks and have four cooking racks at once. It also comes with a dedicated jerky rack which we love. The biggest worry of buying a propane smoker is the built quality and ability for the smoker to retain its heat. The Smoke Vault does this very well. It’s built well and feels solid. When we used it, it was very consistent with its temperature and leaked barely any smoke. Snap ignition for convenient, instant lighting. Temperature range of 50 – 500 °F. This is a very impressive range and allows you to smoke all types of meat at different rates. Three adjustable dampers so you can control the air flow and temperature easily. Heavy duty steel wood tray. This is perfect for larger chunks of wood. If all these features and eye catching design wasn’t enough, then Camp Chef offer a natural gas conversion kit so you can hook it up to a natural gas line and never run out. We love this feature because there’s nothing worse than forgetting to buy extra propane and having to go to the store. If natural gas is your thing, then check out our guide to the best natural gas grills on the market. 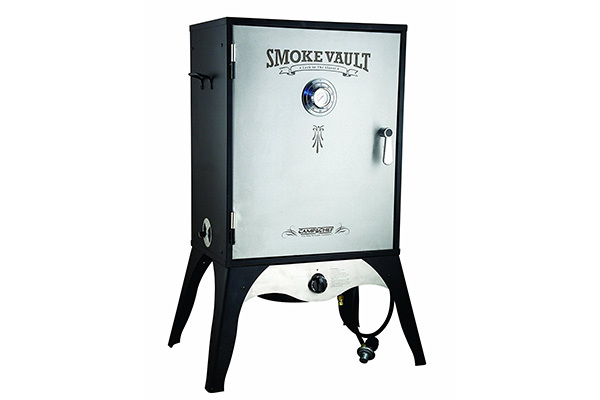 Overall, the Smoke Vault is our favorite propane smoker on the list and we think it easily the one of the top propane smokers you can buy today. The Landmann Smoky Mountain (not to be confused with the Smokey Mountain from Weber) is a 34 inch propane smoker that’s made from heavy duty steel. The build is good, it feels sturdy and looks nice. They’ve managed to make it more interesting with the red and black color scheme and the matte finish. It has a massive 878 square inches of cooking space with four chrome plated, adjustable grates so you’re able to cook almost anything in it. As you’d expect it smokes very well, there are several dampers and a top chimney that make adjusting and controlling the temperature incredibly precise. Latching door system so you know the door will stay closed. Cool grip wire door handles to safely open and close the door. Porcelain coated steel water pan. Heavy duty steel wood chip box, with a lid. 10 year warranty on the brass burner. Overall, if you’re looking to spend a little more money and get a little extra cooking space than the Smoke Vault then the Landmann Smoky Mountain is a great choice. It’s still within the mid-range tier but is brilliantly built, has a lot of cooking space and a great warranty to help with your peace of mind. We’d definitely recommend this and think it’s one of the best propane smokers under 300 dollars. Another Smoke Hollow makes it onto the list. This time the 44241GW. This is one of the most feature rich smokers for the money. It boasts a huge 6.5 cubic feet of cooking area which can handle enough food for many, many people. It has 7 Cooking Grids: 4-Standard Cooking Grids, 2-Jerky Grids, 1-Rib Rack and 1-Sausage Hanger. There’s so much versatility with this model that you’d never need another cooker again. It even has dual stainless steel burners that operate independently of each other to give you maximum control and optimal performance. Two doors, including one with a large viewing window. We always like viewing windows as there’s nothing better than being able to check on your food without opening the door. Large porcelain coated water pan. Two porcelain coated wood chip pans with lids. For roughly $60 dollars more than the Landmann you can get all these features in a huge smoker. It’s big and it’s heavy but made fairly well and feels solid. It does leak a bit of smoke and is recommended to use some gasket to seal up any leaks but we didn’t manage to do this on the one we used. Despite not using gasket we were still able to maintain an even temperature and managed to smoke very easily on it. 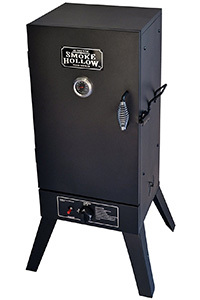 If you’re looking to feed a lot of people and want an easy to use smoker that has a great variety of different smoking options then the Smoke Hollow 44241GW is a great choice. It’s easily one of the best propane smokers under $400. One of the best things about propane smokers is that they are relatively inexpensive. Even the higher end models will likely set you back less than $400. You can get decent quality at prices as low as $150 but will get a better build and more cooking space the more you pay. These are similarly priced to electric smokers. Gas smokers allow you to set it and forget it. If you’re looking for hassle free smoking then gas smokers are one of the most cost effective and time efficient ways of getting great tasting BBQ. Gas smokers are technically portable. As they run off propane bottles they are able to be taken anyway that you can physically carry them. This means they make a great option for camping or tailgating. Propane smokers generally have a very small footprint. This means they are a great option if you’re lacking outdoor space. Temperature a generally very easy to maintain. 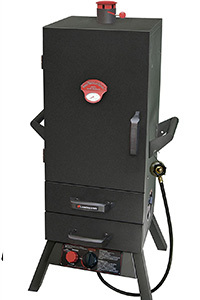 There will be a lot less labor involved with a gas smoker compared to a charcoal one. Most of them also feature push button ignition, which means you can be up and running in a matter of seconds. Propane burns very clean. This means you’re unlikely to get any nasty soot deposits on your food. You won’t get quite the same smoky taste that you do with a proper charcoal or wood smoker. 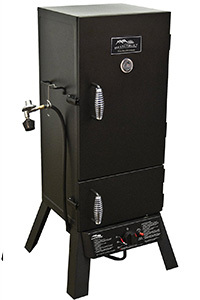 If you’re looking for a simple, hassle free smoke that produces high quality, truly smoky results then we highly recommend investing in a pellet smoker. 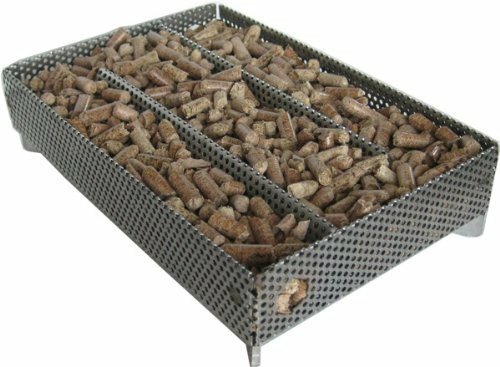 We’ve got a guide to help you choose the best pellet smoker for you. As propane smokers are generally quite cheap, some models lack the insulation and build quality of some of the more premium types of smokers. This means they sometimes leak smoke and heat and can make the cook uneven. Investing in a quality gas smoker should mean you won’t have to worry about these problems though. At some point your gas will run out and you’ll have to go to the store to buy more. This can be a massive pain if you haven’t thought about it and don’t have more in storage. Due to the small footprint of some gas smokers the cooking chamber can be a bit thin. This means that you might struggle to fit in certain cuts of meat. Use quality wood chips or chunks. The smoke produced by the wood chips will give the food different flavors based on the type of wood. For a complete rundown to the best flavor pairings check out our Ultimate Guide to Smoking with Wood. Try using an Amazen (A-Maze-N) pellet smoker or Mo’s Smoking Pouch to help create more smoke. Both of these work in similar ways to create maximum smoke. You fill them up with pellets or chips, place them in the smoker and then wait until they heat up. They are both made in such a way that the wood doesn’t really burn, it just smoulders and smokes. This creates long lasting smoke that will stop you having to replace wood chips every now and then when you’re doing a long smoke. You can make simple modifications to your smoker to make it work better. If you’re finding it’s leaking heat and smoke then you can add sealants to help insulate it. It’s also possible to add a small cast iron skillet in place of the burning box to give a better heat distribution and quicker smoke. We’d recommend experimenting a bit with these depending on which smoke you own. Always use a digital smoker thermometer to give you accurate temperature readings of your food and the inside of the smoker. It’s not enough to rely on the built in one if you want the best results. Keep your gas smoker clean. We’d recommend giving all the racks and water tray a quick wipe down after every cook. After roughly 10 cooks we’d recommend a deep clean. This won’t be too arduous as propane burns very clean, and if you use quality wood or pellets you’ll have very little soot or ash problems. Not only will this help keep things tasting great, but it’ll also extend the life of your smoker and keep it safe. Whilst unlikely, it’s possible for soot or grease to get into and around the burner which stop it from work properly and could be dangerous. It’s also possible for you to add charcoal to your gas smoker. This gives you the best of both worlds. You get a more traditional BBQ smoker flavor from the charcoal, but also the ease of use of a propane smoker. We’d recommend using lump charcoal for this as it will burn cleaner and leave less ash. Read our guide on the best charcoal to get a better idea of why we love lump charcoal. Use our smoker times and temperature charts to make sure you’re cooking your meat to perfection. Check out our guide on how to season your new smoker to make sure you season it correctly. We hope that you’ve found this useful and now have a better idea about propane smokers. If you’ve got more questions then let us know in the comments below.